Glassine envelopes are made of a semi-transparent material which is partially resistant to air and moisture. They are made of the same type material used for the manufacture of stamp hinges. 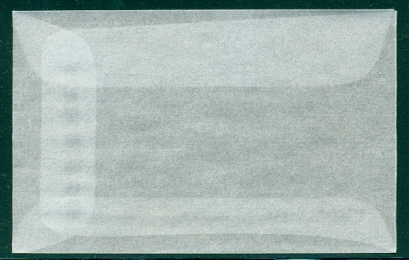 Collectors use these envelopes for the safe storage of duplicates or stamps that are to eventually be mounted in a stamp display or album. When I get a new stamp or set of stamps, and I don't feel like changing the customized album page it fits on at that time, I frequently put the items in one of these envelopes and tape it to the back of the page facing the page that it will eventually occupy. That way, it is safely stored in its proper spot in my album, without having to go to the trouble of reprinting and re-mounting a page that I would prefer to defer. Glassines come in many sizes, from small enough to hold one stamp to large enough to hold business sized covers and souvenir sheets. Most collectors will find that the #2 size (3 5/8" x 2 5/16") or the #3 size (4 1/4" x 2 1/2") is sufficient for most stamps or sets of stamps. Size #4 and #4 1/2 will fit most U.S. plate blocks, size #5 will fit small postcards, and size #6 will fit regular sized (#6) U.S. covers. They are usually sold in bundles of 100 or in boxes of 1,000. The going price for a bundle of 100 of size #2 or size #3 is between $4 and $5, depending on where you buy them. If purchased in boxes of 1,000, they are usually a little cheaper. The larger sizes get more expensive, proportionate to the particular size. There are many websites, as well as sellers on eBay, that have full inventories of all the sizes for sale, sometimes with huge price variations. Take a look and shop around for the best price.